At a fair, most collectors will come and go from a dealer in a matter of minutes. “Any new churches today, Brian?” “Don’t think so, but you’re welcome to have a look." They know what they want. And a dealer's cards will be ordered by popular collecting categories to make searching easy. 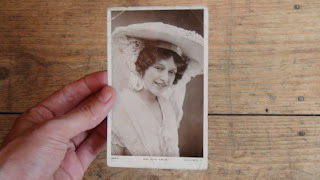 It might be a certain place or artist that a collector is after, or pictures of a famous Edwardian actor or politician. I'll typically stay hunched over one or two stalls the entire time, until my eyes tire. A good message could be in any box. Dealer 2: I found another one as well which was pretty amazing. And that was £80. How many times have I ever had great photos of gypsies like that in the last 40 years? Dealer 1: Who does get them? Dealer 2: Jeremy, not very often. Dealer 1: Who does get them? They’re just not there. No, no. Dealer 2: I won’t see another card like that for 20 years. And I won’t be around in another 20 years. I only got them because I would pay whatever people ask for them which means you’re not making money. That’s the problem…. Dealer 1: A card like that will always appreciate in value…. I am lost in admiration for that one. I hope people enjoyed the documentary last week. A few people have asked since seeing the programme what postcards looked like before the back was 'divided'. 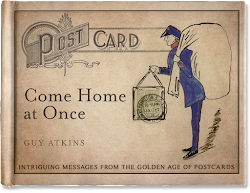 You'll remember the modern card only arrived in 1902 after a German publisher (one F. Hartman) persuaded the Post Office to let him put a picture on the 'front' and then split the other side between message and address. 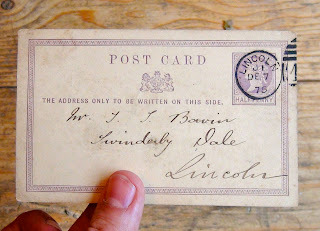 Well, here's an official card sent in 1875. 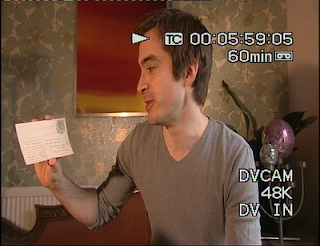 That's 5 years after the postcard was introduced in the UK. It's much smaller than later cards and is printed in mauve. 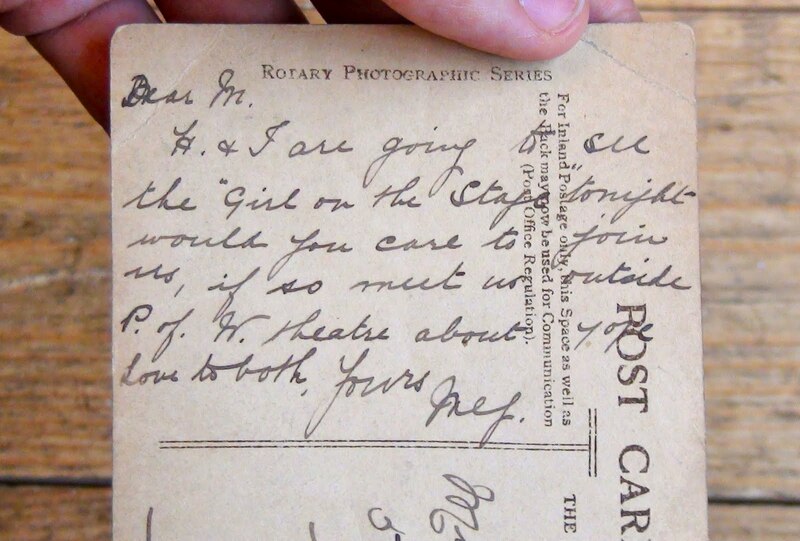 Only the address could be written on the side shown above, with the message restricted to the other. You'll also see the stamp comes with the card. No need to buy one. These cards were all made by De La Rue, the money printers. And incredibly, they were the only cards that could take advantage of the half penny rate for postcards. De La Rue's monopoly was finally relaxed in 1894 after a campaign by the MP Henniker Heaton. After this, privately-published cards could be sent at the postcard rate. Go Henniker! When something becomes so familiar, like the form of the postcard, it's easy to forget the people behind it. Yet how the card looks today was not inevitable. It needed people to change things. And in a curious way, the anonymity of Hartman and Heaton today is testament to the totality of their triumphs. Labels: 1875, anonymous, divided back, Hartman, Heaton.